2 • October 2014 • S I G N & D I G I T A L G R A P H I C S Contents OCTOBER 2014 – VOLumE 29, NO. 1 Wraps Covering the tools and techniques for creating, installing and selling vinyl wraps. 52 Graphic Film 101 Understanding Film Can Save Time and Money By Justin Pate 58 Let's Talk Shop Wrapping Over Windows By Charity Jackson 63 Wraps Projects What's Being Done in the Field 64 Wrapped for Racing Kryptonite Kustomz Lives on the Edge 66 A Commitment to Quality Tiger Wraps Takes the Process Into its Own Hands By Amanda McGrory-Dixon specialty imaging Covering a range of specialized imaging applications, techniques and new technologies. 70 Rotary Engravers Making a Good First Impression By Bill Schiffner Columns 6 e Long View Dumb Luck and the Entrepreneur By Ken Mergentime 8 In the Trenches The Optimist By Rick Williams architectural and environmental Covering dimensional lettering, routing, sandblasting, engraving and fabrication for architectural signage, way-finding, ADA and more. 18 Building Impressions Six Things to Avoid By Scott Franko 26 Sealed With a KISS Shop Takes on Job for Legendary Band By Paula Aven Gladych printing and Finishing Covering the latest in digital printing, media, ink and finishing for banners, backlits, graphics and more. 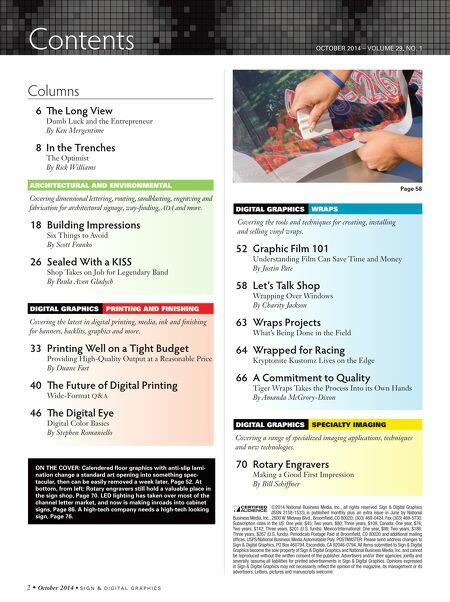 33 Printing Well on a Tight Budget Providing High-Quality Output at a Reasonable Price By Duane Fast 40 e Future of Digital Printing Wide-Format Q&A 46 e Digital Eye Digital Color Basics By Stephen Romaniello digital graphicsl Page 58 ©2014 National Business Media, Inc., all rights reserved. Sign & Digital Graphics (ISSN 2158-1533) is published monthly plus an extra issue in June by National Business Media, Inc., 2800 W. Midway Blvd., Broomfield, CO 80020; (303) 469-0424, Fax (303) 469-5730. Subscription rates in the US: One year, $45; Two years, $80; Three years, $108. Canada: One year, $76; Two years, $142; Three years, $201 (U.S. funds). Mexico/International: One year, $98; Two years, $186; Three years, $267 (U.S. funds). Periodicals Postage Paid at Broomfield, CO 80020 and additional mailing offices. USPS/National Business Media Automatable Poly. POSTMASTER: Please send address changes to Sign & Digital Graphics, PO Box 460794, Escondido, CA 92046-0794. All items submitted to Sign & Digital Graphics become the sole property of Sign & Digital Graphics and National Business Media, Inc. and cannot be reproduced without the written consent of the publisher. Advertisers and/or their agencies, jointly and severally, assume all liabilities for printed advertisements in Sign & Digital Graphics. Opinions expressed in Sign & Digital Graphics may not necessarily reflect the opinion of the magazine, its management or its advertisers. Letters, pictures and manuscripts welcome. digital graphicsl digital graphicsl On the cOver: calendered floor graphics with anti-slip lami- nation change a standard art opening into something spec- tacular, then can be easily removed a week later, Page 52. At bottom, from left: rotary engravers still hold a valuable place in the sign shop, Page 70. 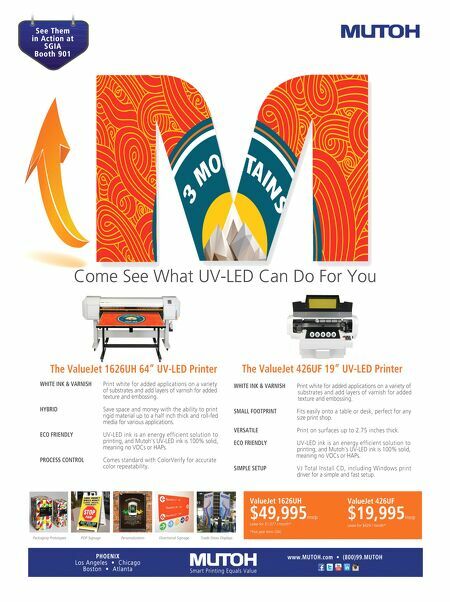 LeD lighting has taken over most of the channel letter market, and now is making inroads into cabinet signs, Page 86. A high-tech company needs a high-tech looking sign, Page 76.